This morning I noted a story in the NZ Herald by Owen Hembry saying that although tourist numbers to New Zealand were up 2.5% at 2.6 million people, the average spend from them was less. It’s a comprehensive story and I recommend clicking on the link above as it is of vital importance to the New Zealand tourist industry. It also reflects international conditions given that many markets are suffering severe economic conditions. There are many positives to this though and the important thing is to focus on how to maximise the opportunity for our industry. The fact is that more people did come to NZ last year and they did spend $5.6 Billion here including airfares. Not to be sneezed at! The consideration then is whether you are in the accomodation, attraction, hospitality or any other industry looking for tourism income, what are you going to do to get your share of the money. How are you going to get that extra table turn, higher occupancy rates, more throughput of your services. How are you going to increase the average spend at your property? What are you going to do differently? We would like to help you with that from a location based services perspective an together with our partners there are many things we can do to help. You will find lots of ideas if you read through some of our past blogs, or you can come and talk to us about your unique business and needs. There are many things we can help with, location based mobile applications and games, cartography, Business Analytics (don’t forget domestic tourists and business travelers who are mostly FIT by nature) and that all business people are also consumers. There are loads of ideas that you will find in our blogs past and future. If you scroll through the blog home page or search the categories you will find many more ideas. Here are 10 blogs which might give you some ideas. We understand your business and please don’t hesitate to talk to us about your specific environment. What Tools do you need to build a location application? As a mapping company we do all sorts of work, and if you are in New Zealand you probably have a printed map that we created at home or in your car. We produce printed maps for the NZ Automobile Association, for Wises, for Yellow, for the NZ Motorhome and Caravan Association and many more. We produce map books, sheet maps, travel atlas, advertising directories and lots more. Another area of our business is custom map creation. We have a huge database of information about New Zealand (and other countries including Australia) and frequently produce either digital map data or printed map data on our plotters on demand. We often produce map data for use on web sites, printed advertising, flyers, posters, Point of Sale and so on. We can produce data in most formats, optimised to the size desired. There is a catch and that is that we have peak times and times when we struggle to deal with any additional work, such as when new annual map books, tourist guides, tourist maps etc are scheduled, so to avoid disappointment, it does pay to get in early. Our peak season starts around June, so if you need maps for a current promotion, now is a good time to talk to us about it. So if you need anything to do with maps and map data for your next campaign, event, publication, conference, advertisement, contact us now. We’d love to help. Time is a commodity you can’t buy more of, people are getting busier all the time. So far we have talked about being able to access and view a map, search for street addresses, Points of Interest and get driving directions to or from a location. We have looked at getting the coordinates of a location to display it on a map and we have looked at Reverse Geocoding to get the nearest street address to the location of a person or object. The next thing is, what if you want to visit multiple locations on the same trip. You might be a merchandiser or service person with several visits to make and it doesn’t matter what order you do them in. You might be on holiday and wanting to explore the many attractions around you, or you could be visiting Open Homes. It isn’t easy, looking at a map, to sort out what order to sort your visits into, you could get a pencil and a ruler and try to work out the route in your map book, or you could run your pen across the pages, as if completing a maze to sort out the order, but eventually you would have such a big mess that you would have to buy a new book. Of course this blog is about LBS, which typically means that we are developing applications for a mobile phone, that means that the user quite possibly doesn’t have a map book on them, or at the very least, doesn’t want to deface the book. Here comes Route Optimisation, or as we call it at GeoSmart, Route2GO. Route Optimisation runs a very complex set of algorithms which look at every possible sequence of stops and comes up with the best order to do your visits. In its simplest form, it allows you to set your start and end points (which could be the same) and then tells you what order to make the visits in. The end result will be fewer kilometres travelled, less fuel, less time and less cost. This way of calculating is called The Travelling Salesman Problem. This concept is also great for people like the delivery truck for a furniture store. The optimised route tells the driver not only what order to do the deliveries in, but in reverse order, tells him how to load his truck so he doesn’t have to keep moving heavy objects around the truck, wasting time and energy and of course reduce carbon emissions and pollution. There is also complex Route Optimisation. In this scenario there are all sorts of exceptions. For the purpose of this blog, we’ll keep it simple and limited to one day, because in a mobile situation, that’s probably all you would do, although of course you can do far more detailed planning in the office, for example a service manager could be planning how to meet their contractual commitments with multiple vehicles, multiple drivers, who don’t necessarily work on the same day and all sort of restrictions on the client side, such as day of the week, time of day etc. But I said I wouldn’t go into that. Imagine you are in Queenstown on holiday and you are using one of the Proximity Based Marketing examples, we outlined for the Location Innovation Awards, where you want to visit multiple attractions. Some services like the Bungy Jump are a bit of a drive and others are close by, so you have logistical situations as to how to fit the most experiences into a day. But in order to do the jet boat ride and the Earnslaw cruise, there are time constraints and you have to be at certain places at certain times. Imagine you are house hunting and a number of the properties you want to look at have Open Homes, which are on at different times. Complex Route Optimisation would let you specify the times you have to be at certain places and also lets you set the amount of time you want to spend at each one. For Open Homes you might plan, say 15 minutes at each property, but the tourist activities have different times. The jet boat ride might be 45 minutes and the Earnslaw cruise an hour and a half. This tool would allow people to really get the most out of their day and at the same time drive the least distance, least time and cost for travel. These web services are available as web services and can work very well on a mobile if the application is designed properly. Of course you could also use them on a web site and then have the results sent to the computer as SMS or perhaps a link that open the mobiles browser. An application that provided these services would use a number of the tools we have previously discussed. You need to identify and geocode the locations to confirm where they are and enable the optimisation. You will want to be able to view the locations on a map to verify what is happening, both for confidence and comprehension. You will need to use the Points Of Interest Web Service to look up street addresses and a database (either your own, a custom one such as seen at Bayleys or Professionals Real Estate. or subscribing to some of the Point of Interest (POI) categories that GeoSmart offers which cover everything from geographical and historical to cafes, restaurants, attractions etc. You can see loyts of examples on AA Maps. The Directions API would be used once you had established the order of the locations you are visiting and can provide turn by turn driving directions on your mobile from a to b to c and so on. Just as an aside, the GeoSmart POI database contains additional contact information including phone numbers, email, web site etc, where appropriate. This means that you can also provide links in the mobile application so that people could add information to the contact list in the phone, or the ability to directly call the number from the application, without having to memorise, or copy and save the number. So now you have used a number of GeoSmart tools (web services and API’s) to create your mobile LBS application. GeoSmart has many more tools available and we don’t stop. Our guys are constantly coming up with new tools and applications. If you haven’t found everything you need to develop your application or concept on the Developer Page, leave a comment or question, or contact us by email at info@geosmart.co.nz. This was the last blog in this series, but there are many more interesting concepts and stories to tell you about, so please keep coming back, bookmark the main blog page or subscribe using your favourite RSS Feeder. And please feel free to comment, it would be great to share your comments and ideas. A key component and possibly the second highest webmap query on the Internet is for Driving Directions and this has even more relevance in a mobile scenario. 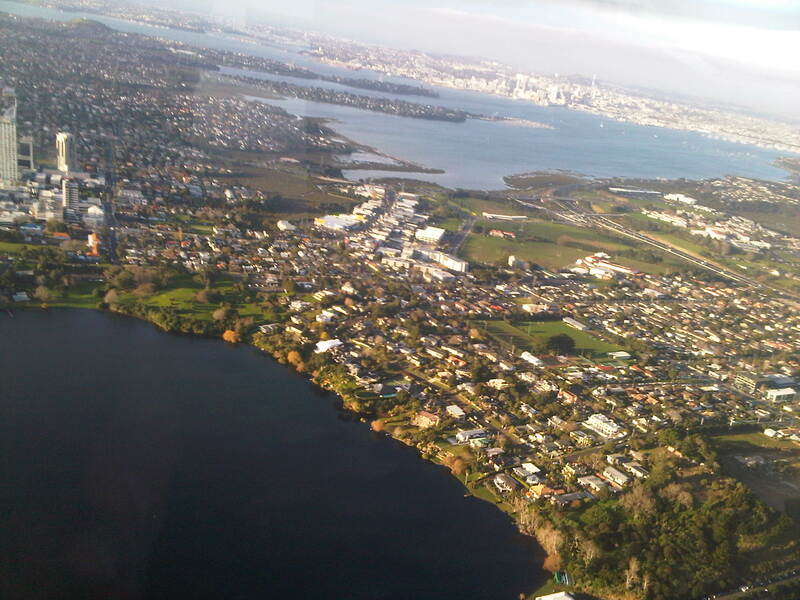 Driving Directions is a key point of difference for GeoSmart in New Zealand. In many other countries, the government provides free or low cost map data of a very high quality and suitable for car navigation and other purposes. In New Zealand this isn’t the case. The LINZ maps are the official datum for cadastral property boundaries. However, their road centreline is derived by a computation of the property boundaries. As I’ve previously mentioned, New Zealand was town planned in Edinborough in the late 1800’s and many of the roads they draughted were never formed or constructed. They are known as paper roads. These roads exist on paper and on the LINZ map data used by services such as Google Maps, but they physically don’t exist. An example is Threepwood Road in Otago. If you have a look on the hybrid mode of satellite view and map view on Google, you will see that while the road exists on the map data, it physcially isn’t there in the satellite photography. This would cause a real problem if you wanted to go for a drive on it. When GeoSmart discovered this problem and realised that, while it didn’t matter a lot for printed maps where you still have to analyse the data and make a decision on where you drive yourself, practically speaking, if you used either car navigation or a printed set of directions and couldn’t see a map as such, paper roads could cause a lot of confusion and grief. With LINZ having the only full maps of New Zealand, we decided we had to make our own maps. To do this we drove almost every road in New Zealand and also used a lot of Orthophotography to develop a driven road centreline, eliminating all paper roads and at the same time creating an accurate road centreline. While collecting this data, we were also able to collect information such as the intersections controls (roundabouts, traffic lights etc), turn restrictions (one way streets, no left turns), speed zones, whether the road was sealed, accuracy of street signs and much more. We were even able to establish things like the angles of corners and inclination of roads (how steep they are etc). This enabled us to build the car navigation dataset used by all the major brands including TomTom, Navman, BMW, Ford, Siemens VDO etc. It also allowed us to create sites like AA Maps and provide the API’s used on Wises web site. Now you can go to AA Maps, plan your journey and print out turn by turn directions from anywhere in NZ to anywhere in NZ and be confident that the instructions will work. So, from there to your mobile. The Directions Web Service will work on any device that can identify a start point and where the user wants to go. The User Interface is up to the developer and will probably vary from phone to phone because of its controls and screen size. For example a touch screen such as that on the iPhone or Windows Mobile, would have functionality closer to a web page, whereas a phone without a touch screen would have to function differently. That is really just a design issue, not a significant barrier. If your phone has GPS or the ability to use cell tower triangulation, it will know where it is. But it is also possible (if you know) to tell your mobile where you are and where you want to go This could be an address you want to get directions to, or it could be Points of Interest from our POI Web Service mentioned in Part 2 of this series. Once you know the start and end of your journey, you can use the Directions web service to guide people directly to your desired location. So now you can have turn by turn directions delivered to your phone. This could be send as an SMS with text directions, it could be an MMS combining text directions with an image of the route map, or an image zoomed in to your destination, or it could be information in your mobiles web or WAP browser, with enanced functionality. Here’s the thing. If you are at home or in the office, you can use your PC, but it is of no use to you in your car or away from the computer. You may not know where you are going to want to go until you are out on the road. An LBS application with the Directions Web Service can give you the same freedom, without the necessity of interpreting a map, or more commonly the map isn’t there when you need it. Pick up the kids, meet someone for coffee, find your way from the car park to the show. All easy to do with LBS. Just as a footnote, a few days ago a 62 year old woman set of from Christchurch to her home on the West Coast of the South Island. She didn’t arrive and her friends and family spent a couple of days searching for her after she crashed her car down a 5 metre embankment. She was eventually found but the story could have been very different. She may not have been found at all, or not until it was too late to save her life, or she could have been found very easily. If she had a mobile with GPS, after she had been reported missing, if the phone was within coverage, it could have been called and located using an LBS service using GeoSmart tools and her searchers could have had turn by turn directions on their mobiles, right to the spot where her car was. I suspect this sort of application will be available within the next few years, but someone has to create it first. Tracking elderly people is something that is also a major opportunity. One of the key things people want in an LBS application is to be able to find Points of Interest (POI) including geographical, community and business POI. GeoSmart has collected and continues to collect information about all the places that people would like to visit, and unlike other databases, includes a lot of information that has importance but isn’t necessarily business related. For example beaches and bays, public toilets, boat ramps, parks etc. Our latest service is called the Point of Interest (POI) Web Service V2. We have full time staff focussed not only on collecting quality spatial information about places you might want to find for an LBS Service or Application, but also making sure that it is current. Where relevant we use ANZSIC Codes which are a standard supported by the NZ and Australian Governments. These offer a layer of categories from high level to more specific, so you can look at food and beverage or Italian Restaurants at either end. We have a browser tool to help you find the correct category here. Our comprehensive database which is used in various forms and subsets on websites such as AA Maps, Bayleys, Winejobs Online and many other sites has a wide range of POI. These include shops, petrol stations, banks, ATMs, schools and where relevant, make sure you get to the right place at the Point of Interest. For example if you are going to a hospital, you probably want the Accident & Emergency entrance. If you are going to the golf course or a school, you want the official entrance and so on. Our data, where relevant includes information such as contact details. The POI Web Service can also be used for geocoding street addresses in order to display them on a map, using our geotagged web map tiles, which can be used on a mobile or normal PC browser. We have a comprehensive database of New Zealand street addresses, which you can try out on the AA Maps website, using our autocompleter. The range of parameters are wide and varied and you can find more information in the Developer Page. A key commonality in successful LBS applications overseas is the ability to find the service you are looking for nearby. For example, you are in the city and want to find a nearby cafe for some lunch. The POI web service would let you specify how close you want to find one and even give them to you in order starting with the closest to you. Our POI database is also used in products such as TomTom and Navman car navigation devices. Because the database is very comprehensive and constantly growing and being validated, you can pretty much develop your application and populate it with our data and be up and running in no time. Another service that we offer in conjunction with the NZ Automobile Association is the AA Maps Bizlocator. This is a free service which allows any New Zealand business to register their location with us and at the same time get a free web map to put on their website to show people where their office, shop or other business location is, assign it to ANZSIC Categories and then be available for addition to our POI database, all for free. The only condition is you have to go online at least once a year to confirm that your data is current. Once the map is up, you can even get and print turn by turn driving directions from anywhere in NZ and print them neatly on A4 paper. All for free. For more information on that please go to this page, where you can set up an account and ‘Add Your Business’. This is part two of a series of blogs on tools for LBS applications. Please feel free to comment or leave questions on this blog. The first thing you need is a map. Many people seem to think (as I did before I joined GeoSmart) that maps are fundamentally the same and equal. Makes sense doesn’t it. We’re a small country and you would expect all maps to have the same data. That would seem to make sense given that the core data for New Zealand is supplied by the Government under the Land Institute of New Zealand. LINZ is the authority when it comes to things cadastral. They manage land titles, topographic data about New Zealand, hydrographic information, the official street name register and is a part of the NZ Geographic Board which is currently busy deciding whether Wanganui should now be called Whanganui. When GeoSmart decided to enter the car navigation business, we quckly found that the ‘official’ maps of New Zealand have a ‘computed road centreline’. In effect that means that they use a system which places the road notionally between property boundaries. This wasn’t a big deal when it came to road maps because a road map requires that you plan your rate based on a paper image and if it is not exactly right, you can interpret the map and get to your desired location. This data also contains ‘paper roads’. Paper roads are unformed roads that were draughted in Scotland in the late 1800’s and never constructed. Again if you were to see a road on a map and it physically isn’t there, no problem, you can work your way around it. Consumers Institute has a number of pages on this topic. Whilst not an issue on a printed map, consider the problems if you tried to use this data for car navigation and routing. 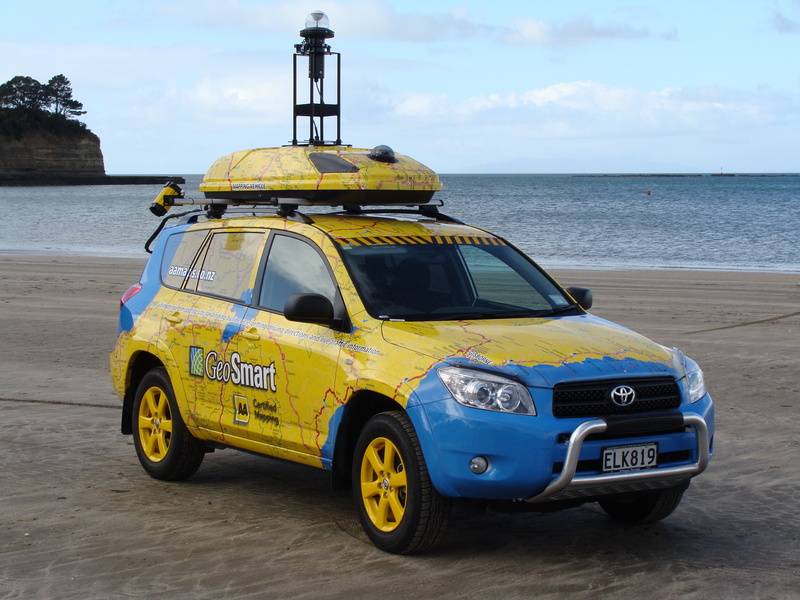 When GeoSmart made the commitment to develop a car navigation database, it was quickly realised that it was necessary to drive every road in New Zealand and also use information gleaned from its Orthophotography in order to create an accurate road centreline database. In doing so, we were also able to capture information including one way streets, dual carriageways, turn restrictions, speed zones, the actual name on the street signs (which were sometimes different to the LINZ data) whether a road was paved or not and much more. In doing this we were able to create a database suitable for car navigation (over 90% market share including TomTom and Navman) and many other services including Fleet Management (around 80% market share including Navman Wireless, Astrata, Xlerate, Argus Tracking, Blackhawk). Fleet management is even more critical. One of the key reasons companies buy Fleet Management solutions is because they can claim back Road User Charges (RUC) as they are not liable to pay taxes when their trucks are on private property. If they were to try to do this using the computed road centreline, they would struggle to pass a Tax Audit because using in accurate maps, they could often be calculated to be off-road, when they are actually on the road. You can best see this in evidence by using a map dataset which overlays aerial or satellite imagery with the cadastral map data set. Especially in rural areas you will find that there are major discrepancies between the photography and the map data. So after that long journey, GeoSmart is now able to offer you access to the Web Mapping API, which can enable you to offer routing, driving directions and other tools including displaying map tiles on a mobile or PDA display. 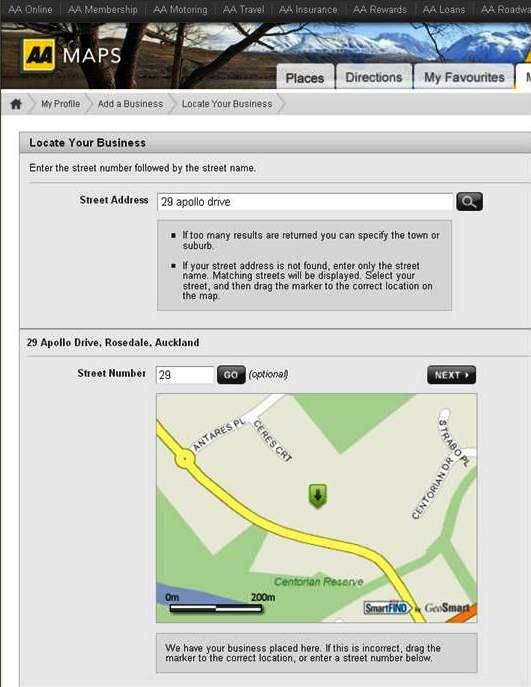 You can search for streets, numbers and businesses. If you explore the many LBS applications being developed overseas (some of which this blog will cover in the near future, you will see that driving or turn by turn directions are a very popular feature of LBS applications. Whether it is a LBS game, a buddy finder, proximity based marketing, planning a run or cycle trip, routing has a part to play and is one of the major reasons that people internationally use LBS applications. If you don’t have a map book (we create the Wises and AA Maps you probably have in your car) or folded map with you, you have less opportunity to interpret data that is inaccurate, so it is imperative that you use accurate information in your application.In countries where the Government provides accurate maps (such as the USA) this is very easy to do, but in New Zealand, to date only GeoSmart has a fully driven road centreline. And of course as you know from a previous blog, we are now re driving all of New Zealand in the RAPIDcV with around 20cm accuracy. So if you want to create an application with accurate maps and directions, the SmartFind WebMap API is a key component. If you would like to check this out, we do of course have the ability to give you a Developer Agreement at no cost so that you can start creating your application. What does LBS have to do with advertising media? The world of information technology and communications (ITC) is changing at a rapid pace and some of the changes have been subtle and unexpected. Some things take a long time for people to get their heads around, but sometimes they just start doing things and take them for granted. Social networking is a classic example that businesses are now trying to understand how they can get involved. Technology is changing the way we live, the way we interact with each other and the way we interact with the businesses and services we enjoy. Last week there was a news story, saying that TVNZ is planning to lay off 90 staff, as it moves to save $25 million. In it, Chief Executive Rick Ellis was quted as saying that the layoffs represent approximately 25% of the costs reductions needed due to falling advertising revenue. I don’t recall who it was but someone recently was telling me that they never watch TV advertising but one evening he and his wife decided that the would watch the TVC’s. The next morning he asked his wife what brands were represented in the TVC’s they watched the previous night, she couldn’t name one. People can avoid TV commercials by recording their programs with MySky and now of course Tivo has also launched in New Zealand. I don’t know if it works in New Zealand, but in the US I believe that you can program your Tivo to not even record advertisements at all as there is an encoded message that tells it when advertising starts and ends. Around the world there are newspapers closing down, going out of business because not enough people are buyig them any more, which means they can’t sell enough advertising to keep them going and people are choosing other media such as the Internet to find their news. Huge numbers of people are favouring their iPods and other MP3 players instead of listening to the radio. People are buying less music CD’s because they have access to other media such as iTunes, YouTube and MySpace to mention a few legal ways they can access their entertainment. Then of course there is mobile and virtually everyone has a mobile phone and sometimes two. The days that your phone was only for voice and SMS are long gone. Today on our mobiles we can check email, take photos and post them onto websites such as Facebook, read or watch the news, Instant Message, check our social networking applications and more. Then there is the location component. A couple of weeks ago I was able to show my location using Google Lattitude on my mobile to my friends. I was able to monitor my pace and calorie burn on Allsport GPS and post photos that I took on my phone straight to my Facebook page while I was running. So back to the original topic, what does all that have to do with advertising media. Simple really. If your phone knows where you are and you opt in to services that tell you about things you want to know about, relative to where you are and when you are there, you can be offered all sorts of relevant goods and services that you will want to know about and take advantage of. This afternoon I was talking to a partner about their participation in a 100km bike race. The bike race would have been sponsored by industry leaders including bike manufacturers, sports drink and supplement brands and other partners. The event and the activity in general takes place on the road, so is very location oriented. If you register for the event, a brand would be very keen to make offers to you. Because you are in the event, they can market very specifically and know that their likely response rate is going to be very high. A LBS application could involve maps and directions, but also relevant Points of Interest. Prior to and after the event they could include where to buy a new bike or bike accessories, or where to get a pre-race service or gear check. It could include where to stay, where to get healthy food, where to train, where to buy your drinks and supplements, a message as you come near a cycle clothing shop of promotional deals, with an electronic coupon displayed on your mobile phone. It could show you where you can get refreshments on the way or even where to find a public toilet. It can show you where the start points are and a route for the supporters to be able to go from point to point without running into the cyclists. It could help companies or supporters get to a cyclist who has gear damage. Prior to or after the event it could even provide a social network to help you find training partners in different parts of the country, for example if you are away on a business trip and have your bike with you. Sponsorship, brand association can be tied to actual sales promotions, which are triggered by people who have opted in to a service who are close to the store or place where a service is available. These sorts of service would be opt-in, which means that people sign up to a service and specify when and under what conditions they may be contacted on their mobile. Because the service offers benefits to the user and the user is specifically interested in the sport and active at the time, there is a far greater likely response rate than traditional scattergun media advertising which is traditonally very costly. GeoSmart of course is able to display maps, provide turn by turn driving directions from anywhere to anywhere in New Zealand. It has a Points of Interest Web Service which can help geocode and display relevant locations like shops, cafes, public toilets etc and the Proximity Tool can assist in identifying relationships between POI which could for example be an alert when a cycle rider is within a kilometer of a bike shop using GPS or other tools to identify the location of the cyclist. This could be combined with a social network, registration for an event, an interest group or perhaps an exclusive service for an event, or the customers of a particular brand, for example you can use this service for free, but only after purchasing an Avanti bike. If you are interested in concepts like this, please subscribe to this blog, and feel free to leave comments or questions. if you want to talk to someone about any of these ideas, please email info@geosmart.co.nz. Free New Zealand web cartography tools for educational and non-commercial purposes. As the Gold Sponsor for GeoCart’2008, the National Cartography Conference at Auckland University from 1-3 September, GeoSmart Maps Ltd General Manager Phil Allen has announced that GeoSmart is offering a set of web tools for web cartographers for use free of charge for educational and non-commercial use. He will outline these in a presentation at the conference on Wednesday 3 September. Using such tools, web cartographers can build complex web, Location Based Services (LBS) and Mobile based GIS solutions such as; Carbon footprints for businesses by measuring the journey times of staff going to and from work and including their business activities to computing calorie burn when a user creates a walk/cycle/running route. The tools include all of the APIs required and a set of maps with many code examples. Allen’s paper will present these tools and advise how educational institutes and the web cartography community at large can take advantage of these for promoting and enhancing our industry. If you have a business, shop, club, church, school, sport venue or any other venue with a web site, we are delighted to offer you a free map to go on your web site. We have created a tool called the AA Maps BizLocator which you can use for free to put a map on yor website. Car Navigation. We supply maps and Points of Interest to 93% (and growing) of the New Zealand car navigation market. By using our service, yor company or location details will be supplied to car navigation product including Navman, TomTom, Siemens VDO, BMW, Ford, Honda, NavNGo, Horizon and many other brands, to help people look for your business by brand, type, name or keyword. Web sites such as AA Maps, Bayleys and Professionals Real Estate and many more that use Points of Interest to add value to their sites. Ok, so it’s free, but will we charge later? No, the AA Maps BizLocator is a free service and will remain free. The only cost to you may be a very small charge by yor web developer to place the map on your web site. We have the only full turn restriction web site for New Zealand because we have driven the whole country and can therefore ensure that people can use our driving directions to get from anywhere in New Zealand to your business, by the fastest route and even print the directions on an A4 sheet via the AA Maps web page, so that your customers or associates can take the directions with them in the car. By providing people with directions to your location for free, you are also playing your part in reducing the carbon footprint by giving them accurate directions and making sure they don’t get lost. It’s amazing how many people you see driving round with a dazed look on their faces and a map ion their hands. Make your business easy to work with and put yourselves on the map with us for free. Even if you don’t have a website, but have a destination, go to the AA Maps website and LIST FOR FREE because your information will still go into the car navigation and web maps to help people find you.